Last night 6 of Christina’s Board of Education members did something extremely unsavory yet equally necessary. 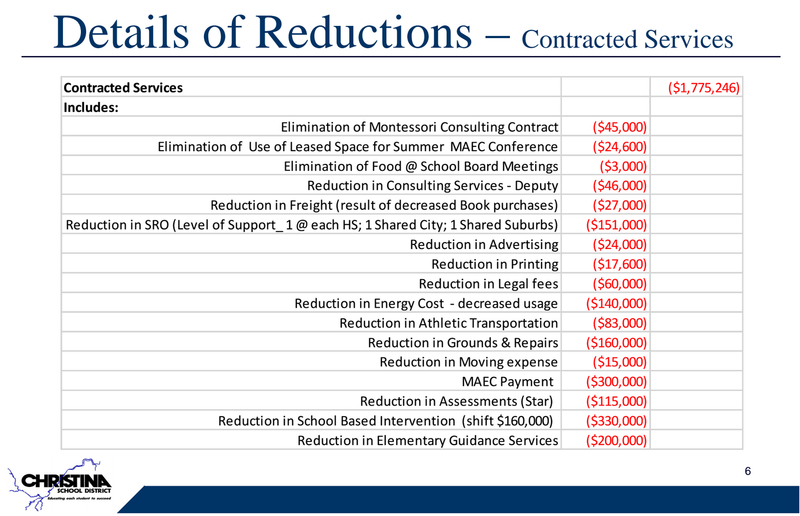 The preliminary budget for 2015-16 was approved with all proposed reductions, some of which are shown here. In what undoubtedly be one of the most challenging years in this District’s history, the Board did make the call when they had to and for that, I thank them. 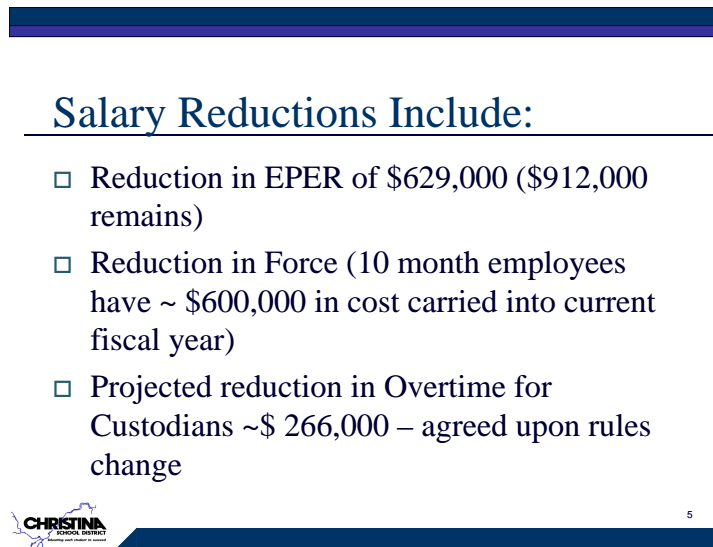 Notable reductions, as mentioned by CFO Silber last night, School resource officers utilization will take the form of 1 officer in each high school, 1 officer within the City of Wilmington to be shared by Bayard Middle and Sarah Pyle, and 1 officer to be shared by the 4 middle schools in the Newark area. Elementary counselors will have their utilization changed as well. Each elementary school will have a counselor, but the days and hours the counselor is present will change from full-day and full-week hours. EPER pay: the same number and type of EPER positions will be available in the District. The amount of funding to fill them will be reduced by $629,000 leaving around $900,000 to be allocated to the schools for use in filling some of the positions. The decisions on what positions will be filled is up to the each school’s leader. 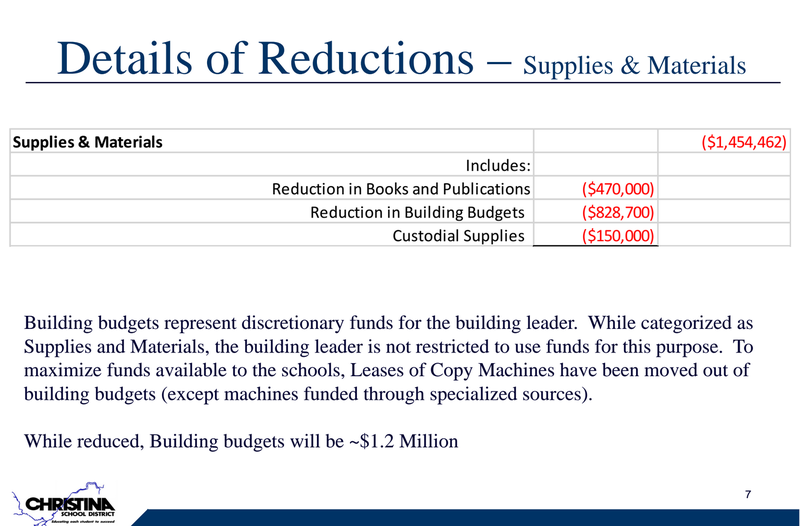 Management and payment of all leases for multi-function copier machines has now been taken off the schools and will be paid and managed by the District business office. Previously each school made payments for their copiers out of their building budgets. That will not be the case this year. Speaking of which, if you or anyone you know works in a CSD building with a leased Canon copier/printer, tell them to send all their print jobs to and do all their copying on those machines. The lease agreements & payments with Canon cover all expenses associated with those machines except paper. Any other printer, the District is responsible for toner, maintenance/replacement, paper, ink, etc. Seems silly at first but toner and printers are expensive and that adds up quickly in schools. Anyway, the analysis and breakdowns will continue. Right now I’m trying to find someone to start an IV drip of caffeine for me.